Ibiza does have a huge reputation for clubbing, misbehaviour and all-night partying. However this is by no means all that Ibiza has to offer. In this country where even the sunset is accompanied by rhythms and electronic beats it is easy to overlook the many peaceful places where natural beauty blooms quietly. The government is beginning a campaign to erase the ‘Gomorrah of the Med’ image that Ibiza has acquired as a result of its reputation as party capital of the world and they are delighted to point out the many beauties and attractions of this lovely island. 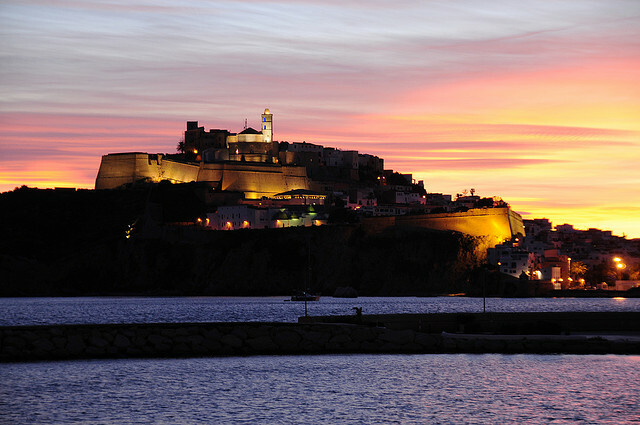 Ibiza is the third largest of the Balearics and was originally settled on by the Phoenicians centuries ago. Some of the original settlements are archaeological digs and it is possible to visit them to be offered a glimpse into the past. Ibiza’s very first industry, limestone quarrying, began when the Phoenicians were on the island and some of the stone was used to build the magnificent city walls. Large areas on the island are designated UNESCO World Heritage Sites and, as such, are protected from development and damage. These sites include ‘God’s Finger’ in Benirras Bay, a dramatically jagged islet off the coast, a perfect off-set to a glorious sunset in the evening; and the original Phoenician settlements at Sa Caleta. Ses Felixes Wetlands recently fought off developers and gained recognition as a threatened environment, to ensure its on-going security. Many areas of Ibiza are so stunningly beautiful that they have achieved popularity with photographers and cinematographers; especially the many vantage points from where the stunning sunsets can be viewed. Individual points of interest include the ‘Egg of Columbus’ in Sant Antoni an enormous egg-shaped statue erected to honour Christopher Columbus; Ibiza is one of several places which claim to be the birthplace of the explorer. Ses Salines national park, full of salt-ponds, is bursting with natural wonders. It attracts visits from photographers, naturalists, history buffs and environmentalists. Visit with the family and enjoy a quiet stroll, bird-spotting and taking a guided walk. The church of St Francis is nestled by the national park and delights in being the smallest church in the area. The paths through the pine woods will lead the visitor all the way to the beaches, where the sunset can be admired, before heading back. Other attractions include the Cap Blanc Aquarium, the design of which is incorporated into an underwater cave to allow the study of species otherwise unseen in such places. Bowling, paintballing and karting are also available for families with children. Ibiza holidays are certainly not just about the clubbing. While the 18 – 30 age groups continues to flock to Ibiza to party the night away and sleep all day, there is a whole world of natural beauty, delicious food and friendly locals, just waiting to be discovered. You can get great priced flights to Ibiza from tour oporators like Thompson so see what bargains you can pick up and get out to this sunshine Island. Jay makes a point of going travelling at least 4 times a year and has so far covered 46 different countries.